These are the best pillow cases. They will last for years. The white is softer than the colored ones. They are very cool to touch, great if you get hot in the night. 1000 threat count are the only ones I will buy, above is too heavy, under is too thin. I have them on all my pillows on the bed and switch them out when I get hot. Well worth the money! I will never buy anything else. Luxurious and elegant, this gorgeous pillowcase set will add softness and style to your bedroom decor. Beautifully crafted from 100-percent, single-ply cotton with a 1000 thread count, these sateen weave pillowcases are soft, cozy, and durable. The rich colors, slight sheen, and pleated hem complete the sophisticated and timeless appeal of this beautiful set. Please see my review for the SUPERIOR EGYPTIAN COTTON 1000 THREAD COUNT SOLID SHEET SHEET. I bought the sheet set, which comes with pillowcases. I also bought another set of pillowcases. These are the most comfortable set of pillowcases and sheets i’ve ever slept on. So soft and thick. And the color i bought (Navy Blue) is beautiful, rich and true. I HIGHLY RECOMMEND these pillowcases and sheet set. I ordered two sets of standard size pillowcases. The fabric is lovely. However, the cases are finished with a sihirttail hem...not what I would expect in 1000 count fabric, and the cases barely cover a standard size pillow. There is not enough drape at the pillowcase opening with the pillow in place to hide the pillow. I put yes for recommend the product, because there was no "maybe" option. I have purchased more than one set of 1,000 thread count sheets for my queen size bed over the past few years. These sheets and pillow cases are by far the best quality and value for your dollars spent. Once the sheets were washed and put on the bed, the fitted sheet fit my 20 inch mattress with no problem (with a little room to spare) and the top sheet left plenty to tuck in at the bottom of the bed. The pillow cases were the standard size and fit perfectly. I wish there were more colors to choose from but I love the quality and will purchase more in the near future. My purchase of these king-size pillowcases took awhile to get here, but I was pleased at first glance. I ordered the burgundy which is a very deep, rich color and did not fade when washed before using them. The thick fabric and beautiful pleating enhance the quality, yet the description of a sateen appearance is erroneous as there is no sheen whatsoever. In fact, I believe the absence of a sateen finish is why they came out of the dryer slightly wrinkled. I'm using them in coordination with decorative pillows so I had hoped for a smoother appearance. I decided to just hide them behind another set of pillows with shams. These sheets are high quality. As with all high thread count Egyptian Cotton sheets these required several washes to soften them. I washed them three times before I applied them to our bed. They are already soft and with every additional wash they will get even softer. These sheets are heavy and during summer nights that is all we cover with. We are very pleased with this product! With our down pillow encased with the Egyptian 1000 thread count cotton solid pillowcase, can not emphasize enough, the comfort and feeling for a restful night. The silky and velvety characteristic of this cotton material leaves you freshly rejuvenated as you get up in the morn. I purchased the 800 and 1000 thread count sheets & pillowcases by the same manufacturer and they are the best quality fabric I have ever seen. I can't tell the 800 from the 1000 since I have both in the same color in pillowcases. The 800 and greater thread count is a great value. These pillowcases are very soft! And a 1000 count is just right! I've purchased thread count higher than 1000 and they shrink too much, no matter what the setting is on the washer or dryer! Super happy with this product! 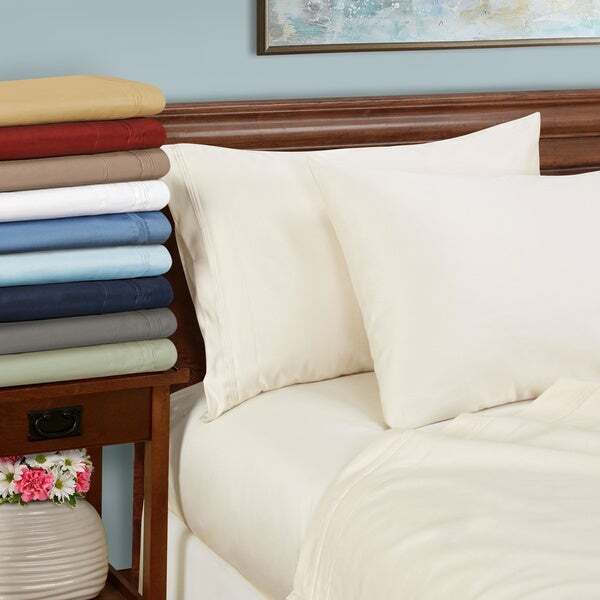 Overstocks Egyptian Cotton 1000 count pillowcases are top quality and reasonable priced. I always buy the extra two pillow cases to compliment the 1000 count sheets since there are 4 pillows on each bed. Overstocks prices and choices are exceptional!!! Highly recommend. I absolutely love, love this sheet set. I had to purchase two new pillowcases for the queen sheet set we had previously purchased. These are the coziest sheets. They are very high quality and very comfortable to sleep in. I call them my coziest sheets. They are a heavier cotton without the sateen weave. Love! Would recommend!!! OMG! I had no idea the weight and quality of this item would be so substantial! They will last longer than I will : &gt;0!! After one wash, the pillow cases are performing perfectly...soft, silky, luxurious! These are exceptional quality. Hefty fabric, great construction. Like the detailing on the cuff of the cases. Nice touch. I love the sheets and the pillow cases - I just wished they would have more colors to choose from. Great fit, and quality. Will buy again. Excellent set to match the same quality sheets! Highly recommend! There really is nothing like a high thread count pillow case that turns to buttah over time. I bought the king sized ones and they are awesomely sized as I can actually get them over a pillow without having to declare my professional wrestlers name. These are very well sewn, hold up well to washing and despite their higher thread count, do not require a "break in" period. I recommend these pillowcases. Heavy heavy sheets--- not soft even after washing. Perfect for heavier sheets and great match in colors with a slight softness that’s appreciated around the head and neck. Very soft and thick fabric. Highly recommend them.. They feel great, but I sweat if it’s not 100% Cotten. Beautiful sheets though. Wish the set I bought offered additional pillows cases but these are really good quality and excellent color choices. I have bought these sheets many times, I have purchased 5 sets over the years, and this set feels like a poly-blend. I compared them to older sets and definitely do not feel the same. I've ordered before and enjoyed them. "is 1 or 2 ply thread use in the sheet set?" Thank you for contacting us love2shop13. These sheets are single ply. Please let us know if you have any further questions. "Do you expect to get the King White pillowcases anytime soon?" Hello bwent, Items are restocked as they become available; however we cannot guarantee an Item will be restocked. Thank you for shopping with us. "The colors for these pillow cases seem to be mislabeled -- with two light blue colors labeled "ivory" and "white" -- at least on my monitor. 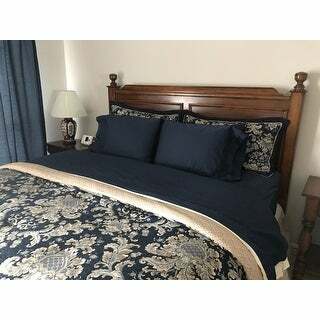 This is especially frustrating since I just purchased the light blue 1000 thread count SHEETS that appear to be matching here: http://www.overstock.com/Bedding-Bath/Egyptian-Cotton-Sateen-1000-Thread-Count-Sheet-Set/6403281/product.html Please 1) correct the photo if you see the same problem that I do and 2) confirm whether "Light Blue" is available for the pillowcases. Thank you." We try to represent the colors of our products accurately, but due to the difference in monitor colors, we cannot guarantee that the color will match exactly what you see on your screen. We apologize for the inconvenience and urge you to take advantage of our return policy. We do currently carry a medium-blue pillowcase.